Great woody character and well balanced sweetness with hints of vanilla. With careful research, help and knowledge from professional brewers, Festival Premium Ale Kits enable you to recreate examples of some of the UK's best loved beers, all within the comfort of your own home. Festival Premium Ale Kits use only the very highest quality liquid malt extracts (3kg per kit) and genuine brewers yeast strains (all individually suited to each style of beer). Festival Premium Ale Kits also contain hop pellets and priming sugar. The hop pellets are simply added halfway through fermentation infusing flavour and aroma into the finished beer resulting in a beer with more hop character than ever before. The precisely measured addition of priming sugar ensures the correct level of carbonation is achieved for each particular style of beer. Showing 2 of our total 9 reviews, with an average rating of 5 stars. 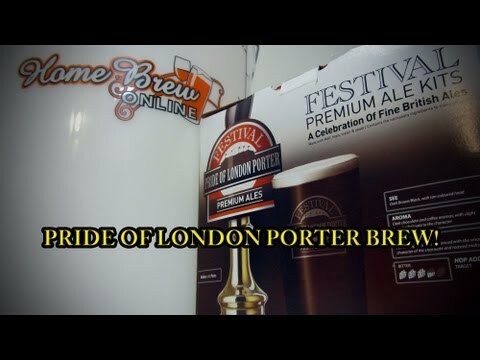 Read all 9 reviews for Festival Old Suffolk Strong Ale Kit. 5An excellent tasting beer after a few weeks maturing. I started this beer in mid-July, and it was fermenting when the outside temperature rose to 31.5C, with no cooler on the fermentation bin. I was worried about the heat affecting the taste, but after adding the hops and leaving for nearly two weeks to brew, I bottled the beer with the sugar for secondary fermentation. This beer is so good, it is difficult to sample it with just one 500ml bottle at a time. It clears really well and the residue becomes a tight gloop in the bottom of the bottle and I have no trouble with bits getting into the glass when pouring carefully. The taste improves with age, and has a nice hoppy finish - but the problem is trying not to drink it all too quickly. If I was served this in a pub, I would happily pay £3.50 - £4 a pint, but home brewing means I can get it for about 65p.